This is the question that has been asked recently by Doug’s Archaeology ‘blog, and it has provoked a good deal of discussion on Twitter. There seems to be a general consensus that ‘people should be told’ but which people, and told what, exactly? My own answer to the question is threefold and begins with the setup of zooarchaeology.co.uk, specifically the ‘news’ page. 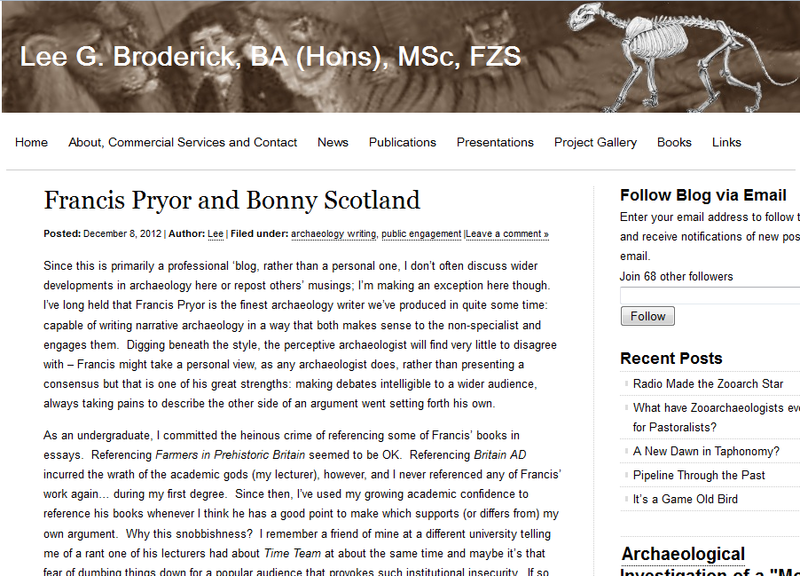 All answers to the question ‘why do you ‘blog about archaeology’ are necessarily personal and that word ‘news’ is revelatory about my own: it was fundamental to my approach when I first created my website and it remains so today. Some people ‘blog frequently and engagingly about new archaeological research from around the world, others write about debates and paradigms in the subject, often for the interested amateur but also sometimes for the archaeology professional or student. My own approach is somewhat more prosaic, narrow, some might even say self-promotional. I briefly debated what to call this section of my website before settling on ‘news’ – should I have called it a ‘blog? The internet is littered with ‘blogs that are established with the best of intentions, that have a few well-meaning, sometimes interesting, articles written in a blaze of optimism before the site is abandoned. I know, I have some of them to my credit/shame. zooarchaeology.co.uk was set up as my shop window – the official front of my consultancy activities and the ‘news’ or ‘blog section was, I thought, an important part of this – both in driving traffic to my website and, more importantly demonstrating to anyone who might look that I was actively involved in research, producing ‘grey lit’ reports and presenting my work at conferences as well as publishing papers. I set myself a target at the time of writing a least one new piece of ‘news’ per calendar month and, nearly three years on, I’ve largely managed to keep to that. In the beginning, these posts were very short; rarely longer than two paragraphs, they merely pointed the reader in the direction of other websites where further details of my latest activities could be found. Sometimes it even functioned as a sort of ‘out of office’ notice. Something strange happened though. People took notice. I acquired followers of my ‘blog. Followers that, for the most part, I didn’t know and who didn’t appear to be archaeologists. Why? I’ve always believed that it’s an important responsibility of all archaeologists to communicate our research to the widest possible audience. Often, the general public may indirectly fund our research, sometimes they even do so directly. Beyond that though is something more rudimentary – if we don’t tell people the results of our research, then what was the point of doing it in the first place? It’s well known that ‘knowledge is power’ but what’s less often iterated is that scientific knowledge is worthless if it’s not communicated. I’m very lucky to be researching subjects of interest to so many people. I also enjoy writing. From about this time last year, the form and length of my ‘blog posts here changed dramatically. I no longer wrote for those who might be looking to contract me but for those who were actually visiting my ‘blog. In making this change, I found that I actually enjoyed the process of ‘blogging far more. Longer posts, aimed at ‘the general public’, whatever that might mean, freed me to express ideas I might otherwise hesitate to articulate in academic print output and forced me to condense research points into accessible language – a sort of accessible, longer and more complete abstract. It also sometimes causes me to approach a familiar topic from a different angle and so clarify or alter my thinking on a subject. So, why do I #blogarch? For three reasons – I still write to demonstrate my research activity, perhaps that is self-promotion but I won’t attempt to deny that motivation to myself or to anyone else. More importantly now though, I do so because I have come to see the platform as a valuable tool for the important job of communicating my research to the wider world . Note ‘my research’ – with one exception, I still confine my writing here, however much I may enjoy it, to my own research and I still usually shy from engaging in wider debates for fear of burning out and letting the ‘blog languish. Finally, as I said, I write because I enjoy the process. Is that as selfish as the first reason? On the subject of communicating archaeology, I’m duty bound to mention that we’ve just fixed the next dates for the Understanding Zooarchaeology short course at the University of Sheffield. It’s been terrific watching, interacting with, teaching and learning from the various students, lecturers, museum curators, and professional and amateur archaeologists that have attended this course over the last three years or so – now nearly two hundred people – some of whom have returned for more advanced courses. Full details of the course are provided below. Recognise special/unusual faunal deposits and understand the principles of excavating animal bones. Care for and store bones after excavation. Identify different species from their bones and teeth. Recognize taphonomy, butchery and pathology. Understand how zooarchaeological material is analysed and quantified. 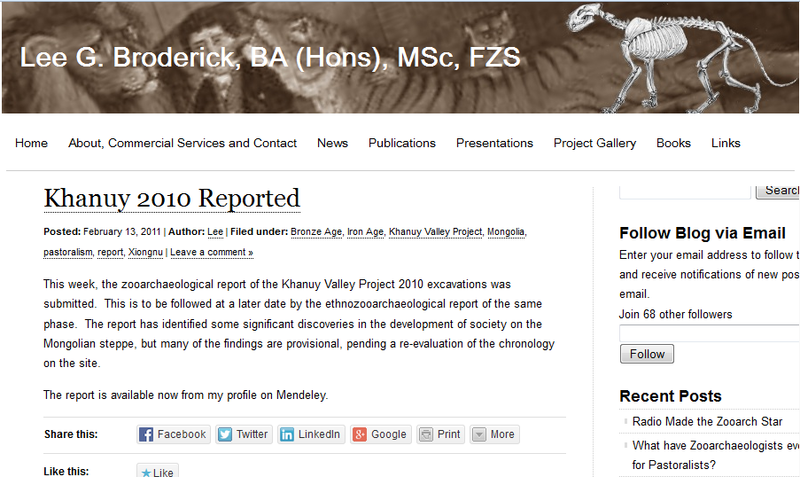 Interpret site reports and zooarchaeological literature. There will be ample opportunity during the course to ask questions and discuss the issues raised during each day. However, if you have a particular area of interest that you would like us to cover in more detail, please let us know when you register for the course. Many people have enjoyed the Zooarchaeology Short Course, including Andrew Lawson who is a Trainee Biological Curator at Manchester Museum. Find out what he thought of the course by reading his blog. Since this is primarily a professional ‘blog, rather than a personal one, I don’t often discuss wider developments in archaeology here or repost others’ musings; I’m making an exception here though. I’ve long held that Francis Pryor is the finest archaeology writer we’ve produced in quite some time: capable of writing narrative archaeology in a way that both makes sense to the non-specialist and engages them. Digging beneath the style, the perceptive archaeologist will find very little to disagree with – Francis might take a personal view, as any archaeologist does, rather than presenting a consensus but that is one of his great strengths: making debates intelligible to a wider audience, always taking pains to describe the other side of an argument went setting forth his own. As an undergraduate, I committed the heinous crime of referencing some of Francis’ books in essays. Referencing Farmers in Prehistoric Britain seemed to be OK. Referencing Britain AD incurred the wrath of the academic gods (my lecturer), however, and I never referenced any of Francis’ work again… during my first degree. Since then, I’ve used my growing academic confidence to reference his books whenever I think he has a good point to make which supports (or differs from) my own argument. Why this snobbishness? I remember a friend of mine at a different university telling me of a rant one of his lecturers had about Time Team at about the same time and maybe it’s that fear of dumbing things down for a popular audience that provokes such institutional insecurity. If so, it’s both irrational and a peculiarly archaeology related fear – I know several history lecturers who have no such qualms about using Simon Schama’s History of Britain. Alternatively, maybe fears run deeper and relate to defining the boundaries of a specialism – after having a go at me for referencing Britain AD for it’s populism (I seem to remember something along the lines of “it’s not a proper archaeology book, it’s a TV tie-in” but maybe I’m reading too much into my patchy memories) my lecturer listened to my bald defence of Pryor as an archaeologist. He somewhat sniffily replied “maybe he’s OK as a prehistorian but he doesn’t know anything about the middle ages” and with a grimace intimated that maybe other poor, stupid, students would reference the book in future and he’d have to read it again (I wonder now if he had in fact read it at all at that point). I thought then, and I think now, that such academic distance should be a strength rather than a weakness: whatever the period, the process of archaeological research and writing is the same and sometimes someone less familiar with prevailing paradigms can provide the necessary impetus to move understanding forward. Such arguments, of course, move beyond the particular case of Francis Pryor who was (is) an archaeologist above all else: if he was/is known as a prehistorian more than anything else than that is because there is more prehistoric archaeology in his Fenland home than later periods – but there are some later sites and any archaeologist will tell you that directing an excavation of that type means that you have to be familiar with all periods. I think this is a debate worth having – long overdue in many ways. At a time when public engagement in archaeology is so fashionable and almost universally acknowledged as necessary to funding in the current climate, even if some archaeologists may wish it were not so, it seems strange that we even need to have it, but there we go: we do. Popular archaeology books are important for communicating archaeology to a wider audience. Writing for a wider audience should not, however, preclude those books from academic merit. Edit: Since posting this, I’ve somewhat serendipitously discovered that my PhD supervisor, Terry O’Connor, has also recently written a ‘blog post about writing style and archaeology. That can be found here: Writing Zooarchaeology.